Prior to starting any of the services listed below, we need to meet with you for a free 1/2 hour “meet and greet”. During this time, we will answer any questions you may have as well as go over a short questionnaire that will help us outline your specific pet and home care needs. But most importantly, we meet your pets. Daily visits is our most popular pet care service. Commuters, as well as very busy Moms and Dads, find this service invaluable. We come to your home to give your pets mid-day relief, a walk in the neighborhood or a play session in your yard. Vacations/Family emergencies/Out of town work schedules: Are you having trouble getting neighbors, family or friends to help watch your pet while you are away…feeling guilty about asking? Sparky’s Pet Sitting Service is a reliable and dependable alternative. We offer 3-4 visits/day for dogs and 1-2 visit/day for cats. Feeding is done per your instructions and water checked each visit. Included is indoor plant watering and mail/packages/newspapers brought in as well as a quick look at the utility room for any leaks or odors that may need attending. There may be an extra charge for outdoor plant watering. Being homeowners, we know how quickly situations can happen in and around the home that, if not attended to immediately, can cause major damage. We have worked through power outages due to storms and fallen trees. We have worked through issues with alarms. We have discovered leaking water heaters. We have found client’s heating systems shut down in the dead of winter. We were able to have the systems repaired and services restored, preventing frozen pipes, water damage and, most importantly, keeping their animal companions warm and safe. While you are away, we will visit each day and check areas of importance….grounds around the house, security, HVAC, circuit breakers and water heater. We will make your home appear “lived in” by changing the lighting in rooms, bringing in the mail/packages/newspapers and watering the indoor plants. We can also act as your contact with the alarm company in case the alarm is tripped. If you have given us a key and you have lost or forgotten yours, contact us and we will make sure you have access to your home. Serving New Canaan, Darien, and Wilton, CT since 2002, you deal directly with the owners of the company – educated, responsible, mature adults. Your animal companions stay in their familiar, stress-free home environment. Your pets will have personal attention on a scheduled basis so that they know who is coming and when. 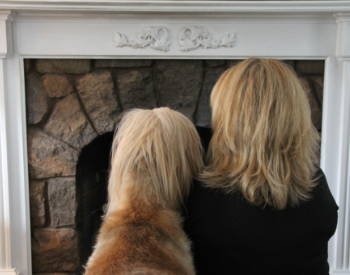 Because we are the only ones doing the caregiving, your pets will see the same person on each visit. Your animal companions will not experience “travel trauma” or run the risk of being lost in transit. By staying in their home, your pet will not have exposure to illnesses such as kennel cough or dog flu. And for you, there is peace of mind knowing that your pet and home are being watched by caring professionals. Lastly, nothing works in this business like word of mouth. So, if you refer a friend and they hire us, you receive a free visit as a “Thank You”. That’s a $25 savings for you!